The 6 in. Deep-Cut Coping Saw is designed for scroll-style cutting in wood trim and other ornate wood projects. The frame is made with heavy-duty steel and is treated with a rust-resistant coating for durability. Its extra-deep 6 in. clearance allows for angled and curved cutting in hard-to-reach areas. The new DEWALT hand saws, with their flexible blades, slide into places power saws will not reach such as when cutting dowels, drywall, shims, trim, moulding, and more. The saw blades are also heat-induction treated for long blade life. DWHT20000 features a reversing blade with push button for left or right handed cutting. The Husky 20 in. Wood-Handled Aggressive-Tooth Saw features hardened teeth with a tri-bevel design to tackle the toughest cutting jobs. The large handle size is designed to help lessen fatigue when cutting. Constructed of precision ground and set teeth for smooth and accurate cutting. The tri-bevel tooth design is to help provide more efficient cutting. The blade is constructed of high carbon steel for strength and durability. The heat treated teeth provide longer life. 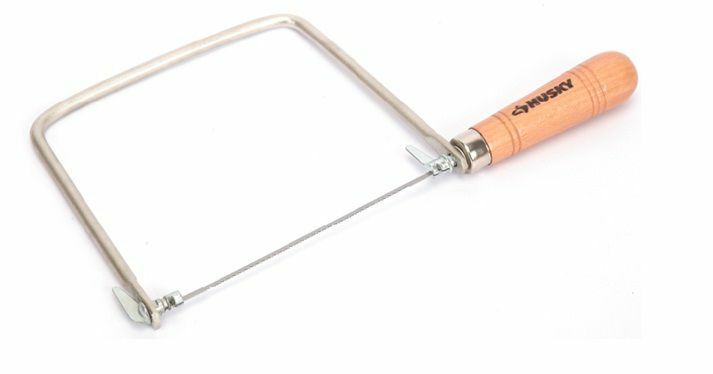 Husky Coping Saw The 6 in. Deep-Cut Coping Saw is designed for scroll-style cutting in wood trim and other ornate wood projects. The frame is made with heavy-duty steel and is treated with a rust-resistant coating for durability. Its extra-deep 6 in. clearance allows for angled and curved cutting in hard-to-reach areas.